For the manufacturer of Jeeps, see Jeep. Marmon-Herrington converted Ford 1/2 ton truck, sometimes called the "Grandfather of the Jeep". 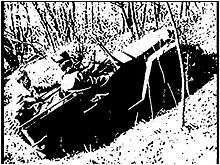 The Bantam no.1 'Blitz Buggy'. The Ford Pygmy at the U.S. Veterans Memorial Museum. By now the war was under way in Europe, so the Army's need was urgent and demanding: Bids were to be received by July 22, a span of just eleven days. Manufacturers were given 49 days to submit their first prototype and 75 days for completion of 70 test vehicles. The Army's Ordnance Technical Committee specifications were equally demanding: the vehicle would be four-wheel drive, have a crew of three on a wheelbase of no more than 75 in (1,905 mm) – that was later upped to 80 in (2,032 mm) – and track no more than 47 in (1,194 mm), feature a fold-down windshield, 660 lb (299 kg) payload and be powered by an engine capable of 85 lb·ft (115 N·m) of torque. The most daunting demand, however, was an empty weight of no more than 1,300 lb (590 kg). Initially, only two companies entered: American Bantam Car Company and Willys-Overland Motors; Ford Motor Company joined the competition later. Though Willys-Overland was the low bidder, Bantam received the bid, being the only company committing to deliver a pilot model in 49 days and production examples in 75. Under the leadership of designer Karl Probst, Bantam built their first prototype, dubbed the "Blitz Buggy" (and in retrospect "Old Number One"), and delivered it to the Army vehicle test center at Camp Holabird, Maryland on September 23, 1940. 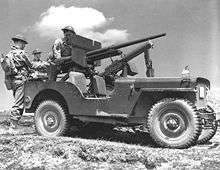 This presented Army officials with the first of what eventually evolved into the World War II U.S. Army Jeeps: the Willys MB and Ford GPW. Since Bantam did not have the production capacity or fiscal stability to deliver on the scale needed by the War Department, the other two bidders, Ford and Willys, were encouraged to complete their own pilot models for testing. The contract for the new reconnaissance car was to be determined by trials. As testing of the Bantam prototype took place from September 27 to October 16, Ford and Willys technical representatives present at Holabird were given ample opportunity to study the vehicle's performance. Moreover, in order to expedite production, the War Department forwarded the Bantam blueprints to Ford and Willys, claiming the government owned the design. Bantam did not dispute this move due to its precarious financial situation. By November 1940, Ford and Willys each submitted prototypes to compete with the Bantam in the Army's trials. The pilot models, the Willys Quad and the Ford Pygmy, turned out very similar to each other and were joined in testing by Bantam's entry, now evolved into a Mark II called the BRC 60. By then the U.S. and its armed forces were already under such pressure that all three cars were declared acceptable and orders for 1,500 units per company were given for field testing. At this time it was acknowledged the original weight limit (which Bantam had ignored) was unrealistic, and it was raised to 2,160 lb (980 kg). For these respective pre-production runs, each vehicle received revisions and a new name. Bantam's became the BRC 40. Production began on March 31, 1941, with a total of 2,605 built up to December 6. 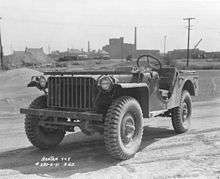 As the company could not meet the Army's demand for 75 Jeeps a day, production contracts were also awarded to Willys and to Ford. After reducing the vehicle's weight by 240 pounds, Willys changed the designation to "MA" for "Military" model "A". The Fords went into production as "GP", with "G" for a "Government" type contract and "P" commonly used by Ford to designate any passenger car with a wheelbase of 80 in (2,032 mm). By July 1941, the War Department desired to standardize and decided to select a single manufacturer to supply them with the next order for 16,000 vehicles. Willys won the contract mostly due to its more powerful engine (the "Go Devil"), which soldiers raved about, and its lower cost and silhouette. The design features in the Bantam and Ford entries which represented an improvement over Willys's design were then incorporated into the Willys car, moving it from an "A" designation to "B", thus the "MB" nomenclature. Most notable was a flat wide hood, adapted from Ford GP. By October 1941, it became apparent Willys-Overland could not keep up with the production demand and Ford was contracted to produce them as well. The Ford car was then designated GPW, with the "W" referring to the "Willys" licensed design. During World War II, Willys produced 363,000 Jeeps and Ford some 280,000. Approximately 51,000 were exported to the U.S.S.R. under the Lend-Lease program. A further roughly 13,000 amphibian jeeps were built by Ford under the name GPA (nicknamed "Seep" for Sea Jeep). Inspired by the larger DUKW, the vehicle was produced too quickly and proved to be too heavy, too unwieldy, and of insufficient freeboard. In spite of participating successfully in the Sicily landings in July 1943, most GPAs were routed to the U.S.S.R. under the Lend-Lease program. The Soviets were sufficiently pleased with its ability to cross rivers to develop their own version of it after the war, the GAZ-46. 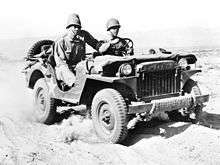 Origin of the term "jeep"
One account of the origin of the term "jeep" begins when the prototypes were being proven at military bases. The term "jeep" was used by Army mechanics for any untried or untested vehicles. "Jeep" was also used for several types of heavier equipment. In the armor branch, "jeep" generally referred to a 1/2 or 3/4 ton truck, with the 1/4 ton called a "peep." The militarized Minneapolis-Moline tractor was known as a "jeep," named for the cartoon character. Finally, heavy equipment transporters -gooseneck lowbed trucks for oversize, overweight cargoes, were known as "jeeps" by 1940. Although folk etymology claims that it was due to slurring of an unused acronym, "GP" for "General Purpose", a more likely part of the jeep name came from the fact that the vehicle made quite an impression on soldiers at the time, so much so that they informally named it after Eugene the Jeep, a character in the Popeye comic strip and cartoons created by E. C. Segar as early as mid-March 1936. Eugene the Jeep was Popeye's "jungle pet" and was "small, able to move between dimensions and could solve seemingly impossible problems". In early 1941, Willys-Overland staged a press event in Washington, D.C., having the car demonstrate its prowess by driving up the Capitol steps. 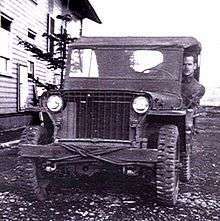 Irving "Red" Hausmann, a test driver on the Willys development team who had accompanied the car for its testing at Camp Holabird, had heard soldiers there referring to it as a jeep. He was enlisted to go to the event and give a demonstration ride to a group of dignitaries, including Katherine Hillyer, a reporter for the Washington Daily News. When asked by the reporter, Hausmann said "it's a Jeep". 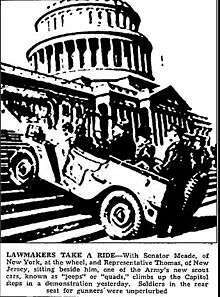 Hillyer's article appeared in the newspaper on February 20, 1941, with a photo showing a jeep going up the Capitol steps and a caption including the term "jeep". This is believed to be the most likely origin of the term being fixed in public awareness. Even though Hausmann did not create or invent the word "Jeep", he very well could be the one most responsible for its first news media usage. Ford's stamped nine-slot steel grille design on a 1945 Willys. Willys made its first 25,000 MB Jeeps with a welded flat iron "slat" radiator grille. It was Ford who first designed and implemented the now familiar and distinctive stamped, vertical-slot steel grille into its Jeep vehicles, which was lighter, used fewer resources, and was less costly to produce. Along with many other design features innovated by Ford, this was adopted by Willys and implemented into the standard World War II Jeep by April 1942. In order to be able to get their grille design trademarked, Willys gave their post-war jeeps seven slots instead of the original Ford nine-slot design. Through a series of corporate takeovers and mergers, AM General Corporation ended up with the rights to use the seven-slot grille as well, which they in turn extended to Chrysler when it acquired American Motors Corporation, then manufacturer of Jeep, in 1987. After the war Ford unsuccessfully sued Willys for the rights to the term "Jeep", leaving Willys with full rights to the name. From 1945 onwards, Willys took its four-wheel drive vehicle to the public with its CJ (Civilian Jeep) versions, making these the first mass-produced 4x4 civilian vehicles. 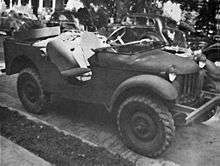 In 1948, the U.S. Federal Trade Commission agreed with American Bantam that the idea of creating the Jeep was originated and developed by the American Bantam in collaboration with some U.S. Army officers. The commission forbade Willys from claiming, directly or by implication, that it had created or designed the Jeep, and allowed it only to claim that it contributed to the development of the vehicle. However, American Bantam went bankrupt by 1950, and Willys was granted the "Jeep" trademark in 1950. The first CJs were essentially the same as the MB, except for such alterations as vacuum-powered windshield wipers, a tailgate (and therefore a side-mounted spare tire), and civilian lighting. Also, the civilian jeeps had amenities like naugahyde seats, chrome trim, and were available in a variety of colors. Mechanically, a heftier T-90 transmission replaced the Willys MB's T84 in order to appeal to the originally considered rural buyer demographic. 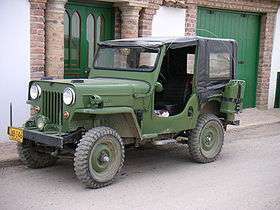 Willys-Overland and its successors, Willys Motors and Kaiser Jeep supplied the U.S. military as well as many allied nations with military jeeps through the late 1960s. In 1950, the first post-war military jeep, the M38 (or MC), was launched, based on the 1949 CJ-3A. In 1953, it was quickly followed by the M38A1 (or MD), featuring an all-new "round-fendered" body in order to clear the also new, taller, Willys Hurricane engine. This jeep was later developed into the CJ-5 launched in 1955. Similarly, its ambulance version, the M170 (or MDA), featuring a 20-inch wheelbase stretch, was later turned into the civilian CJ-6. Before the CJ-5, Willys offered the public a cheaper alternative with the taller F-head engine in the form of the CJ-3B, a CJ-3A body with a taller hood. This was quickly turned into the M606 jeep (mostly used for export, through 1968) by equipping it with the available heavy-duty options such as larger tires and springs, and by adding black-out lighting, olive drab paint, and a trailer hitch. After 1968, and -A3 versions of the CJ-5 were created in a similar way for friendly foreign governments. Licenses to produce CJ-3Bs were issued to manufacturers in many different countries, and some, such as the Mahindra corporation in India, continue to produce them in some form or another to this day. The French army, for instance, produced its Willys MB by buying the Willys license to enable the manufacture of their Hotchkiss M201. 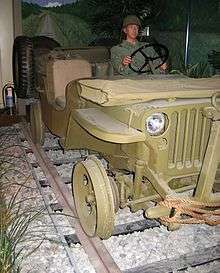 The compact military jeep continued to be used in the Korean and Vietnam Wars. In Korea, it was mostly deployed in the form of the MB, as well as the M38 and M38A1 (introduced in 1952 and 1953), its direct descendants. In Vietnam, the most used jeep was the then newly designed Ford M151, which featured such state-of-the-art technologies as a unibody construction and all around independent suspension with coil-springs. Apart from the mainstream of—by today's standards—relatively small jeeps, an even smaller vehicle was developed for the US Marines, suitable for airlifting and manhandling, the M422 "Mighty Mite". Eventually, the U.S. military decided on a fundamentally different concept, choosing a much larger vehicle that not only took over the role of the jeep, but also replaced all other light military wheeled vehicles: the HMMWV ("Humvee"). The Canadian Army took delivery of 195 militarized versions of the CJ-7 in the early 1980s. These were put into service as a stop gap measure between the retirement of the M38A1 and the introduction of the Iltis. They were codified by the Canadian Forces with the Equipment Configuration Code (ECC) Number 121526. 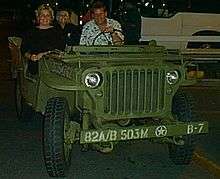 When American troops began to leave the Philippines at the end of World War II, hundreds of surplus jeeps were sold or given to local Filipinos. The Filipinos stripped down the jeeps to accommodate several passengers, added metal roofs for shade, and decorated the vehicles with vibrant colors and bright chrome hood ornaments. The Jeepney rapidly emerged as a popular and creative way to reestablish inexpensive public transportation, which had been virtually destroyed during World War II. Recognizing the widespread use of these vehicles, the Philippine government began to place restrictions on their use. Drivers now must have specialized licenses, regular routes, and reasonably fixed fares. Starting in 1950, a Jeep-engined utility vehicle was produced by Autoar in Argentina. Starting from 1951, a new sedan was introduced using the same 2199 cc Jeep engine and manual transmission. 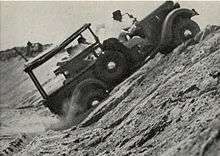 It was fitted with overdrive to compensate for the Jeep’s low axle ratio. In 1952, a new overhead valve 3-litre six-cylinder was announced, but was probably never built. At that time, Piero Dusio returned to Italy. In the 1950s, production was sporadic, and models built included a station wagon with a Jeep-type 1901 cc engine. In 2004 and 2005 Chrysler produced approximately 1,000 Willys Special Edition Jeep Wranglers. ↑ "TM-9-803 1⁄4 short ton (0.22 long tons; 0.23 t) 4x4 truck (Willys-Overland Model MB and Ford Model GPW)". US War Department. 22 February 1944. Retrieved 26 May 2015. ↑ "View topic - The History of Jeep". links4jeeps. 24 February 2007. Retrieved 26 May 2015. 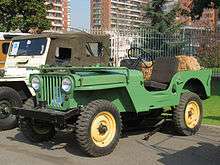 ↑ "Jeep 1941 - 2001". difflock.com. Archived from the original on 15 April 2012. Retrieved 26 May 2015. ↑ Fowler, Will (1993). Jeep Goes to War - a pictorial chronicle. Courage Books. ISBN 9781561382354. ↑ Borth, Christy (1945). Masters of Mass Production. p. 220. Retrieved 26 May 2015. ↑ Allen, Jim (2003). Jeep. Motorbooks International. p. 28. ISBN 9780760314869. Retrieved 26 May 2015. ↑ Pulos, Arthur J. (1988). The American Design Adventure, 1940-1975. MIT Press. p. 20. ISBN 9780262161060. Retrieved 26 May 2015. ↑ Ford's GP designation did not represent "general purpose"; that #REDIRECTwas a government description. 1 2 Ware, Pat (2010). Military Jeep Manual: An insight into the history, development, production and role of the US Army's light four-wheel-drive. Haynes. p. 39. ISBN 9781844259335. ↑ "Willys Jeep 1945-1953". Classic Car History. Retrieved 26 May 2015. ↑ "Jeep News: Introducing the U.S. Army-Inspired 2004 Jeep Wrangler Willys". Chrysler Group. Retrieved 26 May 2015. In August 2011, the VOA Special English service of the Voice of America broadcast a report on the Bantam Jeep as part of its American Mosaic series. A transcript and MP3 of the program, intended for English learners, can be found at The Jeep – One of the Most Famous Vehicles in the World – is Celebrated at its Birthplace. Wikimedia Commons has media related to Bantam BRC 40. Wikimedia Commons has media related to Ford GP. Wikimedia Commons has media related to Willys MA. Wikimedia Commons has media related to Willys MB / Ford GPW.